Birmingham is an exciting city packed with options for everybody. Birthplace of the Balti, heavy metal and Cadbury’s chocolate, Birmingham is the only English city outside of London to have 3 Michelin starred restaurants. ThirtyFifty like Birmingham has plenty of options too - whether it’s your birthday, a chance to catch up with friends, or for corporate entertainment a wine tasting in and around Birmingham is the perfect way to have fun and learn about wine. Whatever you’re looking for we have a number of different wine tastings and formats from pure entertainment to educational, but the most important element is having fun. As the home of chocolate why not try one of our Chocolate and Wine tastings ? All from ThirtyFifty the award winning tasting company. If you are looking to go out for your wine tasting we have worked with a number of venues in Birmingham that we are happy to recommend. The list below highlights our most popular wine tasting venues in Birmingham, to see our full list of venues across the country please go to our venues page. Typically we charge £30 travel costs for Birmingham, but this is subject to availability, so it's worth booking early to avoid missing out. We have partnered up with Thai restaurant Chaophraya to give a special Thai wine tasting dinner. Perfect if you are looking for a fabulous Thai meal with wines matched to each course. During the evening you will learn how to taste like a professional as well as the key principals on how to match food and wine while enjoying a scrumptious meal from Chaophraya. 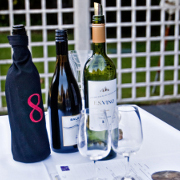 The 2 hour evening session is educational and fun, ideal for anyone with an interest in wine. Below are forthcoming dates.